Home > Understanding Wine > What Are Blended Wines? Blended wines are wines made from two or more grape varieties from the vitis vinifera species of grape. If an EU wine contains less that 85% (in the New World 75%) of the predominant grape variety then it is technically a blended wine. 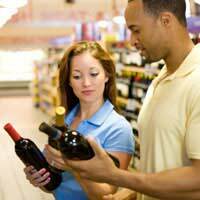 Blended wines are common and a blend in no way denotes poor quality. One common blended wine is the Spanish ‘Rioja’. A typical Rioja will contain around 60% Tempranillo with other Spanish grapes making up the rest of the wine. ‘Rioja’ therefore denotes a particular region rather than a grape. The name ‘Tempranillo’, conversely (and there are some good cheap ones available), denotes a wine that is made predominantly from the Tempranillo grape, but that it is not from Rioja. Due to the presence of Tempranillo, Rioja is well known for its ‘curranty’ flavour and medium bodied character. Similarly, red Bordeaux is commonly made from a blend of red grapes, accounting often for the predominance of the mixture ‘Carbernet Merlot’, which has become popular in supermarkets in recent years, and is produced in the New World as well as in France. There are obvious practical benefits of blending grape varieties, including the leeway it gives the producer: If one crop is particularly low in yield in a given year, what has been produced can be mixed with other varieties. Blending also allows the vintner to produce unique flavours, such as a blend of the earthy tones of red Carbernet with the spicy Shiraz grape. It is blending that gives the unique quality of champagne (although, as discussed elsewhere, this is a quality that can be produced, more-or-less outside the Champagne region). Interestingly, and a point that surprises many newcomers to wine, Champagne is made predominantly with red grapes (Pinot Meunier and Pinot Noir): it is not the colour of the grape that affects the final colour of a wine, but the colour of the grape skin. A white wine is fermented after the grape skins have been removed; a red wine is fermented with red grape skins left in the wine vats during fermentation. Along with the two red grapes, the Chardonnay grape is incorporated in a blending and brewing process that was created over centuries in the Champagne region in order to compete with the neighbouring Burgundy. Blending is yet another facet that along with ‘vintage’ and ‘terroir’ allows a wine's taste to be further manipulated. Most wines are in fact blends, with the little discussed ‘Cabernet Franc’ wine used to bulk up many blends, or even single grape ‘varietals’, allowing bolder wines to be tempered with its subtle flavour. The best way to accustom oneself to a blended variety is to first get to know a varietal wine (see related article) and to then try this variety of grape with a blend. For example, if you get to know the strong and easily detectable full bodied taste of Chardonnay first, then try a Chardonnay blended with – for example – Semillon, a grape noted for its sharp citrus flavours. From thereon knowledge of blended wine varieties will equip you with the information needed to better appreciate wine.